Simon Reynolds is one of my favourite writers, and he’s one best at writing about one of my very favourite things – pop music. Like anyone seriously writing about pop music, he is rightly unable to separate it from everything else than fuels it. Social, cultural, and economic trends fuel his books as much as a forensic analysis of how sounds, rhythms and aesthetics power music’s dialectic. Check out Energy Flash for the birth and maturity of dance music, Rip It Up for a reclamation of the feverish creativity of the post-punk era, and Bring The Noise as an anthology of his music journalism since the 80s, assessing the disruptive innovation of ‘black’ and ‘white’ music. Whatever he writes about, it becomes infused with fresh insights about the time the music was made, and the climate in which it was received. So when he writes about our contemporary era, it’s very likely that he’ll have something to tell us about ourselves. 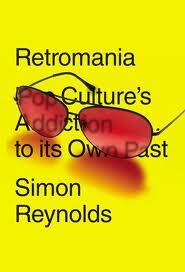 When it becomes clear that Retromania is about how pop music has become infatuated with the past, then you fear what this say about us as the willing audience of that pop. And we’d be right to worry. Where pop once used visionary ideas and new technology to create new and exciting possibilities, it now resorts to salvaging ever more esoteric ideas from cultural history. Where pop leads us most other things follow. And there are many benefits to this magpie approach that we see played out beyond the world of pop, in the way we interact with technology and the world around us. In this month’s Wired Robin Dunbar – he of Dunbar’s Number (150) – discusses how the increased mobility and decreasing family size of the last 100 years has resulted in a new shape and structure of our social networks, which are more flexible and less geographically fixed. Ever likely, then, that we take refuge in our ability to customise the past, or to lend significance to our present with instant nostalgia. It gives us a sense of place and belonging, and a more comfortable narrative to adhere to. I know that in a sense nothing is new, and that everything is a remix. So stealing from the past is nothing to be ashamed of – and it’s always happened in pop. But we now so fetishise the past in order to determine our place in the present that it’s begun to exclude other ways of thinking about our current selves. It seems odd that in a time when technological innovation is making more and more things easier and better, we use that progress to make the past more resonant. Or maybe it’s precisely because technology is moving so fast that we need everything else to stay more static.